The contenders are a 21-year-old girl in California with a net worth of $900 million, an egg and a lime (wait for the chicken). According to recent hard-hitting numerical data, from the Global Social Media Committee of Go Viral, a stock image of an egg has become the most liked image on Instagram, with more than 40 million likes so far. 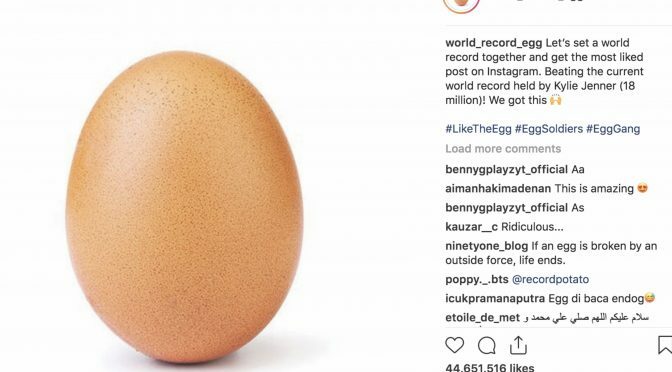 The caption on the January 4 post by the verified account EGG GANG (@world_record_egg) read: “Let’s set a world record together and get the most liked post on Instagram. Beating the current world record held by Kylie Jenner (18 million)! We got this” (Plus the raising hands emoji). Last I checked, it had 44,651,516 likes. Comments varied. Someone called oioi.oi.oi said, “Are you seriousssss guys?” (sic). Another user @annika.carmoddy said, “Eggs are great”, and imaginatively added an emoji of — wait for it — an egg. Another user, one @muttaqin_22 wanted to know, “What is the benefit for me? If i like the picture” (sic). Why is that a big deal, you say. It’s like EGG GANG said. Kylie Jenner, the seventh-most-followed user on Instagram (123 million followers), used to have the most liked photo on Instagram (18million) for a picture from Feb 2018 of her newborn baby, Stormi Webster, holding her thumb. And anyone who’s not talking to a football and eating food out of soggy FedEx boxes on a deserted island (Cast Away movie reference, if you live in a cave), knows that beating the most liked photo — especially when it’s by a simple image of an egg — counts for something. Beating Kylie Jenner is big news. Kylie Jenner is important, not to me specifically, but to the digital world. It’s a realm that offers measurable data and allows anyone to post opinions and delude themselves — and gullible others — into thinking they’re facts. It also creates excitement of having the power to share your own content and be a part of something that “matters”. So, where does the lime play a role? The lime became important when a nobody became a somebody after creating a Twitter account of a lime, getting more than 60k likes, in an attempt to beat the egg’s record. So, what do Kylie Jenner, the egg and the lime have in common? I’d say all three are things no one’s going to think of on their death bed, but choose to spend hours fixating over online now anyway. Not me, I like to stay grounded (apart from when I’m writing a critical piece on these honorable entities). But seriously, why in the world is an image of a plain ol’egg getting millions of likes? Internet users have given so much meaning to nonsense that they are losing sight of news more deserving of attention. The irony isn’t wasted on me that I am taking up an entire page to talk about eggs and limes and Kylie Jenner, but someone’s got to call it out. When a powerful digital world that is accessed by millions exists, why do we share such rubbish? I’m all for a little harmless fun, but what if we shared more positive stories, and memes that were actually meaningful? May sound like overstating the cause, and call me a dreamer, but that stuff could change attitudes and consequently, the world. The internet enables people in positive ways: to raise funds for the needy, to create awareness of important issues, to help people connect and so on. And yet, the meaningless drivel continues. According to the website The Verge, on Twitter, ‘Half and Onion’ amassed 635,000 followers in an attempt to overtake the popularity of President Donald Trump’s account. Last year, a teen got a year’s worth of free chicken nuggets from Wendy’s after he challenged the fast food outlet that he could get 18 million retweets for it. He managed to beat Ellen DeGeneres’ record of most retweeted tweet and won the prize. But hey, at least a teen got free food and Wendy’s also donated $100,000 to a charity on his behalf. I still can’t wrap my head around how an image of an egg, and an obviously jealous lime, can get so much attention to a point where I had to write this article. What is even the meaning of life? I’d argue that, these days, meaning depends on what’s trending online — whether that’s a lime, a chicken nugget or an egg.